Domingo was born to Tomas and Aleja Martinez in 1917 in New Mexico. He had an older sister named Maria Guadalupe, older brothers named Macario and Pedro, and younger brothers named Marquez and Maxamino. His parents indicated in the 1920 Census, that they were born in Mexico along with his older siblings. Therefore, Domingo was from an immigrant family, speaking predominantly Spanish in his household. 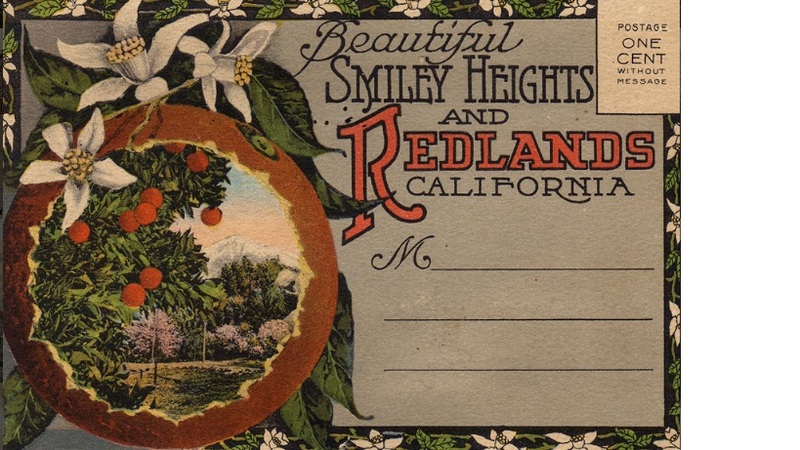 In the 1920 and 1930 censuses, his family stayed within Hidalgo County, New Mexico but between 1935 and 1940, the family moved to Redlands, California. In the 1940 census, Domingo was 22 years old, working as an orange picker at a packing house in the local area. In fact, his entire family also worked at the same company. It is possible that his family moved out west for better job opportunities. A lot of people moved west to avoid the Dust Bowl of the 1930s because farmers often lost their land to bad loans and a harsh environment. Overproducing on the land and the ensuing drought in the region made this region desolate. According to Domingo’s enlistment record from August of 1943, he had grammar school education. He was single with no dependents and volunteered for service. All of Martinez sons enlisted in the war. Domingo’s younger brother Maximino enlisted 11 months prior to Domingo’s enlistment. Pedro enlisted on November 12, 1942, younger brother Marquez (Marcos) enlisted on September 14, 1944, making their involvement in the war a family effort. After Pearl Harbor, the nation went from having an isolationist philosophy to one that fully supported the war. Domestic industries were converted to make wartime production supplies and equipment, such as munitions, tanks, planes, uniforms, etc. To be absent from work, striking for better working conditions and being a member of a labor union was often seen as an act of disloyalty. As the male population shipped out overseas, women went to work in great numbers. "Rosie the Riveter" became the iconic image of the new industrial worker. The biggest advantage that the Allied force had was the U.S. war machine. While the enemy had home field advantage and often had superior equipment, the U.S. homefront continually supplied the front lines with the much needed equipment to continue the fight. In addition to rationing and recycle drives, Americans stateside were also encouraged to buy war bonds to help fund the war. Because domestic production decreased greatly during the war era, there were little material goods to buy, allowing Americans to loan the government money with the expectation of being repaid at a later date. In hindsight, no one would have predicted how buying of war bonds during World War II would help to necessitate the post-war economic boom in the 1950s and 1960s and the dramatic change of the American landscape. Once the country declared wars on the Axis powers, fear of espionage, sabotage, and a west coast invasion took root across the country. These anxieties would lead to Executive Order 9066, removing anyone of Japanese decent, citizen, and immigrant resident, on the west coast to "relocation camps" farther inland. Though none of the interned Japanese proved to be disloyal, many returned to their lives struggling to rebuild, often in neighborhoods that didn't want them. By the time Domingo enlisted and finished basic training in August of 1943, the 313th Infantry Regiment, had already spent time at Camp Pickett, Virginia; Camp Blanding, Florida, and spent time in Tennessee. When Domingo enlisted, his unit was in a desert training facility in Yuma, Arizona at Camp Laguna. The unit would stay here until the end of November 1943 and would move on to Camp Phillips in Kansas. Since basic training would have taken a few months, it is most likely that Kansas is where Domingo met up with the 313th Infantry Regiment,. In Kansas, the unit got their “POM” training, meaning the “Preparation for Overseas Movement” training, which would be their final round of training in a winter scenario before going abroad. By April 1, 1944, the 313th Infantry Regiment, was relocated to Camp Myles Standish in Massachusetts going to their point of embarkment at Boston on April 6. 6,000 troops were squeezed onto the Strathmore, which only accommodated 1,500 people during peacetime voyages. The transport ship was convoyed across the Atlantic and landed at the port of Glasgow from the Firth of Clyde on April 16. From there the 313th Infantry Regiment,would be stationed at Garswood Park and Marbury Hall until six days before the D-Day Invasion. Their final location on British soil was at Lype Hill at Somersetshire. The 313th Infantry Regiment, would land on Utah Beach a little after 4:00 p.m. on June 14, 1944, with no enemy opposition. 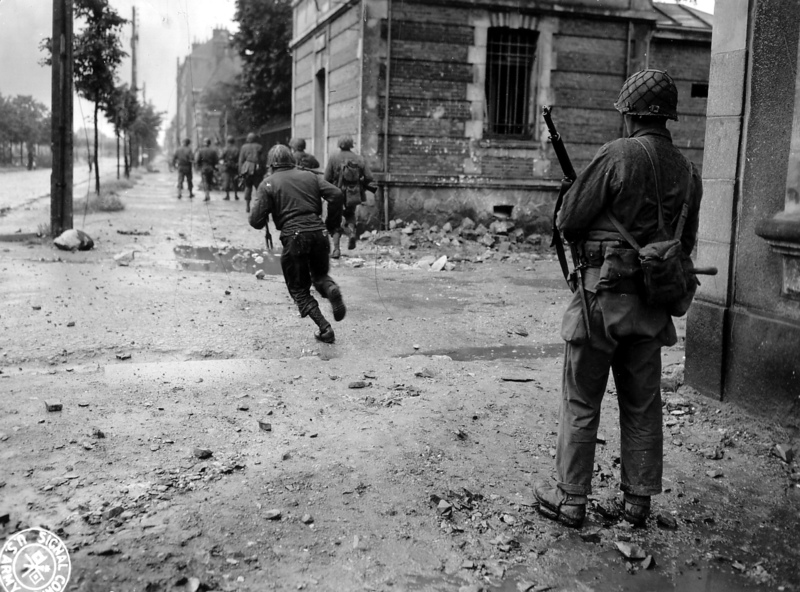 Its mission: to secure the Cotentin Peninsula, thereby securing the Cherbourg Harbor, in conjunction with the 4th and the 9th Infantry Divisions. Immediately Domingo and his regiment (part of the 79th Infantry Division) would have to learn how to make surviving easier in the new Normandy terrain. Maneuvering through the hedgerows proved difficult, as each bordered off every field/property, making thousands of individual battlefields to fight through. Encountering hedgerows, German 88s, German tanks battalions and infantry, progress was slow. Because the port of Cherbourg would greatly benefit the Allied supply lines, the Germans heavily defended the area and when they surrendered, they placed mines and other explosive traps throughout the city and harbor to make the harbor unusable for Allied purposes. After securing the port on June 27, 1944, Domingo and the 313th Infantry Regiment would head south out of the Cotentin Peninsula toward mainland France. 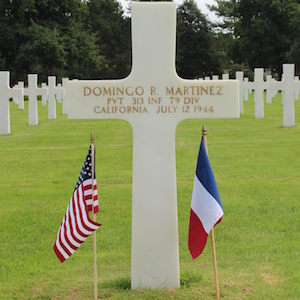 July 12, 1944 was the day that Domingo R. Martinez died. While individual military records were not obtained regarding Domingo, the military history of his unit provides a glimpse as to what happened on July 12. 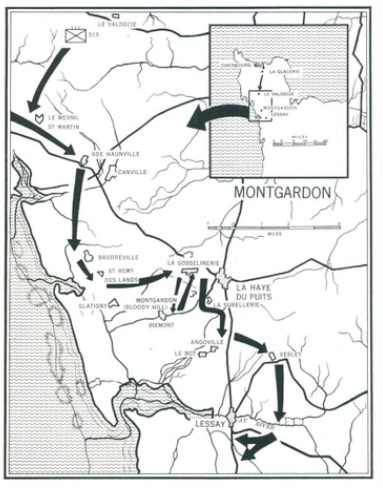 The 313th Infantry Regiment was combatting the enemy in the area between La-Haye-du-Puits and Lessay between July 11 and July 16. 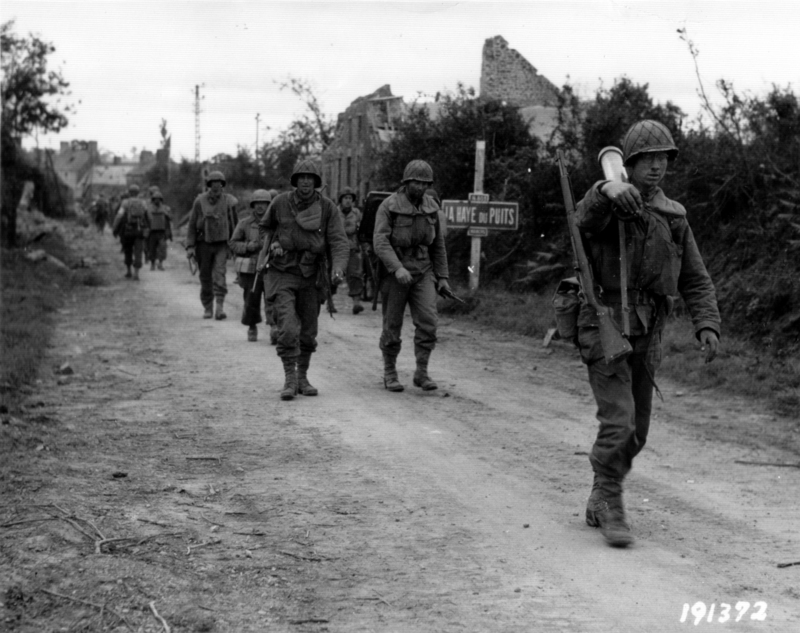 On the night of July 12, a task force from the 313th Infantry Regiment was sent to capture the vicinity of Le Bot in Angoville-sur-Ay. It took three attempts to meet this objective and Domingo may have died in this manner. July 12, 1944 signifies the loss of an unsung American hero. It is difficult to compare one’s own contributions to the United States, when considering the contributions of Domingo R. Martinez. He paid the ultimate sacrifice in a great war that jeopardized the fate of all humanity. It takes valor to enlist in an ongoing war. It takes faith and optimism to leave one’s family behind. It takes courage to face the enemy day after day. Domingo did this and so much more without hesitation. Domingo had a big family that loved him. 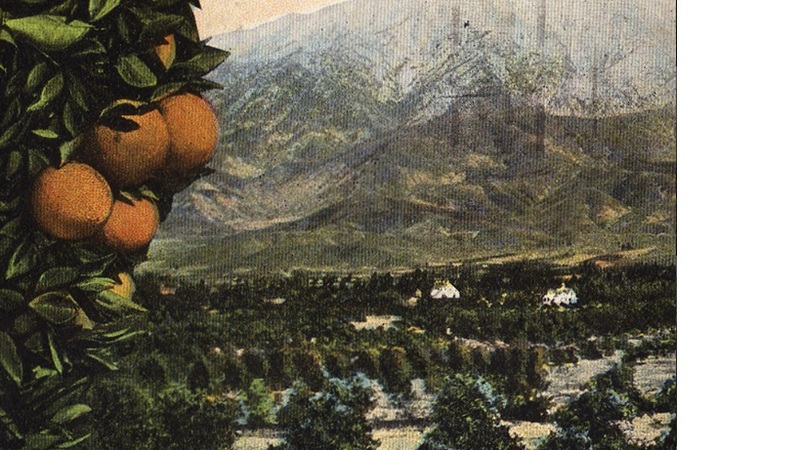 He and his family made a life for themselves in Redlands, California working in the thriving agricultural industry. As a son of immigrant parents, Domingo spoke Spanish and adopted the “hard working” spirit of the American culture. He had everything going for him and he willingly sacrificed his future for the greater good. I can only imagine how his mother felt when she either received the telegram or had officers from the war department come to her home to inform her of the loss of her son, Domingo. Because all of her sons enlisted, in that moment, she couldn’t know if it was one or all of them. I wonder how Domingo’s passing impacted the rest of his family members. It is unfortunate that his name has become lost to history but with this memorial, I hope to honor his legacy. The story of Domingo R. Martinez is one that hits close to home. Working on Domingo’s memorial holds a lot of significance because Domingo is a local - our high school is a 30 minute drive to Redlands. Knowing that we likely appreciated the same view of the San Bernardino mountains, tasted the same flavors of the Inland Empire citrus and even felt similar tremors from our local San Andreas Faultline, makes him all the more real, even though we never got the chance to meet him. Completing a second Silent Hero memorial and honoring another courageous individual has been rewarding. Researching the histories of his military unit paints a different perspective that I didn’t know before - that kind of information is simply not provided in a high school textbook. I have come to learn that Ancestry.com is a powerful tool in helping to build connections to a different era. It helps to build a sense of belonging - a notion of how Domingo fit into the history of our country. Being able to contact a distant relative of the Martinez family through Ancestry.com made the project even more special. Together, his living relatives and I were able to provide each other with additional details that helped bring his story back to life. The personal connection that was made in researching Domingo will last a lifetime. Knowing that he is just one of the millions of lives lost due to war within the last century, puts into perspective how valuable life is; how unity for a just cause can make positive change; and how taking a stand for one’s beliefs can make this world a better place. My appreciation for our fallen heroes and surviving veterans has only continued to grow over the years. 1920 United States Federal Census: Domingo R. Martinez. Provo, UT, USA: Ancestry.com Operations, Inc., 2010. 1930 United States Federal Census: Domingo R. Martinez. Provo, UT, USA: Ancestry.com Operations, Inc., 2010. 1940 United States Federal Census: Domingo R. Martinez. Provo, UT, USA: Ancestry.com Operations, Inc., 2010. "Domingo R. Martinez." American Battle Monuments Commission. Web. 11 Jan. 2016. “It's only 1000 minutes from Cheyenne to Berlin! Let's keep `em moving!”; ca. 1942 - ca. 1943; Records of the War Production Board, Record Group 179. USA. National Archives and Records Administration. World War II Army Enlistment Records, Created, 6/1/2002 - 9/30/2002, Documenting the Period Ca. 1938 - 1946: Domingo R. Martinez (39708292). N.p. : n.p., n.d. Access to Archival Database. Web. 18 Jan. 2016. U.S., Headstone and Interment Records for U.S. Military Cemeteries on Foreign Soil, 1942-1949: Domingo R Martinez. Provo, UT, USA: Ancestry.com Operations, Inc., 2014.